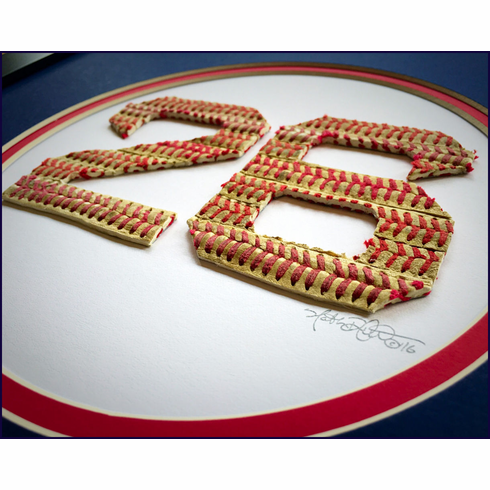 Wade Boggs 26 original artwork commemorates Wade Boggs and his #26 being retired by the Sox this season! Limited to only 26 pieces! 26 original artwork is hand-made, hand-signed and hand-numbered by the artist, Nathan Rueckert. Each original 26 art is mounted on a white mat board and double matted inside a circular navy blue and red mat. Black frame measures appx. 14" x 14". ** This original art is not licensed, endorsed, or sponsored by MLB properties or the Boston Red Sox, and the baseballs used were not used by MLB or the Red Sox. Everything Baseball / WadeBoggs.net Exclusive Item!